The Jean Coutu Group (PJC) Inc. and organizers of Mardis Cyclistes de Lachine bicycle races have come to a three year agreement. As such, the pharmaceutical giant becomes the new title sponsor of the Mardis series for the 2012, 2013 and 2014 seasons. The president and founder of the Mardis series, Tino Rossi, is excited about the idea of presenting the 35th edition of this event with the support of Jean Coutu. He notes that since the beginning of the Mardis series, only a very select number of sponsors have been associated with these bicycle races. The sportswear company Apogée is now also associated with the Mardis Cyclistes for the presentation of the 35th edition. Companies renewing their partnership with the Mardis series include: Specialized-Quilicot, Samson Groupe Conseil, LaSalle Fiat, Molson, Bacardi, Assurances Morin, la caisse Desjardins Provost de Lachine and the McDonald’s restaurant in Lachine. In 2012, the organisation of the Mardis Cyclistes can again count on unconditional support from the borough of Lachine. The borough mayor, Claude Dauphin, provided crucial support during the search for a new title sponsor. “I am very happy with this new agreement. 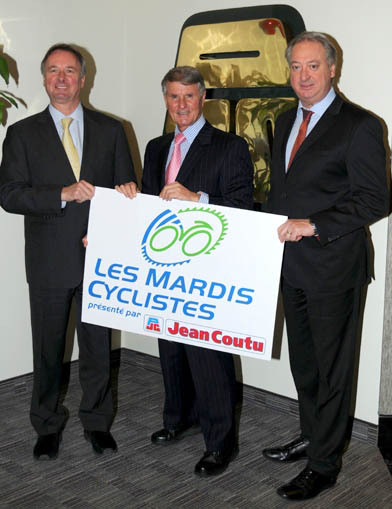 The Jean Coutu Group is a first-rate partner for a major event like the Mardis Cyclistes. The residents of Lachine, cycling and Jean Coutu will all be winners from this partnership,” concluded the mayor. The first race on the 2012 calendar will be take place on Tuesday, June 5th. Record prize winnings of $30,000 will be up for grabs this summer. About the Mardis series... Since 1978, bicycle races (called ‘criteriums’) have been held on Tuesday evenings each summer in the borough of Lachine. The youngest cyclists start at 5:30 pm, followed by Juniors and by the women at 6:00 pm. The elite men begin at 7:00 pm for a 50 kilometre race around LaSalle Park. There are 10 stages in the series, meaning that races continue over 10 weeks. The Mardis speed record was established in 2009 by Guillaume Boivin, when he won the 50 kilometre ‘crit’ with a time of 58 minutes 52 seconds. It is free for spectators to watch these exciting races. For more information, visit www.mardiscyclistes.net .